After the extirpation of the invasive English population in 1899 to September of 1901, if the records ICCR accessed are accurate, Lord Lu, 45th Count of Yanqing 1835-193?, was instrumental in saving the species. He acquired the few remaining animals from European zoos and nurtured a herd at Shaoni Reserve. Threatened again by both World Wars, the species survived largely due to the efforts of Lord Lu and his son Lu, later 47th Count of Yanqing. The current Lord M.D. Lu Z.D.Z., O.I.T., (titular claimant of the of Yanqing county), resides in Shijinglong, Yanqing and may be contacted through the ICCR for conservation work involving the ‘Milu Deer’. Incidentally the other name of “Milu Deer Reserve Park” is ‘David Deer Park’. ICCR recommends that all records extirpate mention of David and replace with the prominent Zoologists such as Jueshi (equivalent of Sir) Shen Kuo instead. How could a Chinese capital feature a garden named after a foreign person? Incidentally, restoration works’ costs for damages dating back to 1800s should fall upon the invading nations of China with costs inflated though perhaps at a REAL inflation rate rather than any outlandish claims. Damage should best be calculated at the invitation of indepdendent ‘damage consultancies’ or legal firms (preferably historical ones dating back to the 1800s) WITH Chinese government oversight and at government expense (residence and food fees could be paid for, not 5 star for certain but something appropriate to foreign bureaucrats, perhaps rentals in medium level flats etc..). This International Reparations Committee, must be approached carefully and in a manner that benefits relations between nations while still communicating a sense of righteous, though not overdone, ‘outrage’ and overall should be considered the Chinese Government GIVING business to independent firms in foreign countries to calculate wartime reparations (such as theft of Pekingese dogs), destruction/theft of paintings and artworks, destruction and damages of palace property, arson charges to extant militaries involved in burnings – ALL calculated equitably, and for certain in a manner that could be drawn out to enhances communcations between legal fraternities between China and China’s former invaders. The choice to eventually expand to colonialisation and cultural damages, and issues like the “Najing Holocaust” could eventually be taken up, and Diaoyu or Sansha included as well. Overall the money would be well spent and the Chinese government would be better placed internationally PROVIDED, appropriate tact and planning are used, perhaps with certain trade concessions directly acknowledged as reparations and official apologies from appropriate institutions if viable. Best wishes to the Foreign Office and Diplomatic Corps of China on this endevour. Halycyon days, and the winds shall abide. The Politburo based around Marxist ideology needs to seek true at very least the character of Chinese roots. The yushi dafu 御史大夫, translated as Censor-in-chief, was the highest-ranking state official supervising and controlling the officialdom of the empire. During the early decades of the empire the office of Censor-in-chief was only second to the Counsellor-in-chief (chengxiang 丞相) but gradually transformed into the highest position of the institution of the Censorate (yushitai 御史臺). The Censors of the Former Han period 前漢 (206 BCE-8 CE) were practically Vice Counsellors and often took part in important political decisions. Counsellor and Censor were called the “two ministries” (erfu 二府). The position of Censor often served as a springboard to that of Counsellor. It nominal salary was 2,000 bushels of grain mid-level. All memorials to the throne had to pass the office of the Censor before being processed, and all edicts issued by the emperor were to be countersigned by the Censor before being promulgated and transmitted to the Counsellor and the regional governments. The Censor so served as a person to check the influence of the Counsellor. The control of officialdom by the Censor meant that he was allowed to indicate corrupt or illegal practice of each state offial and to interview officials charged of misdoings. His assistant was the Palace Aide to the Censor-in-chief (yushi zhongcheng 御史中丞, or Vice Censor), several attendant censors (shi yushi 侍御史) and bandit-suppressing censors (xiuyi yushi 鏽衣御史). The task of the Vice Censor was supervising the regional inspectors (cishi) and the local governors (shou) and magistrates (ling) directly, and to investigate the court officials. He was also to supervise all punishments of state officials. The 15 attendant censors had the main task to indicate misdoings of state officials and to initiate arrest and interviewing of suspects. Bandit-suppressing censors were only appointed in case of need and supervised the suppression of rebellions. At the end of the Later Han period 後漢 (25-220 CE) the warlord Cao Cao 曹操 abolished the Three Dukes and reinstated the offices of Counsellor and Censor. During the whole Later Han period the tasks of the Censorate were managed by the Vice Censor, while Censor-in-chief was a rather vain honorific title. For a short time during the Wei period 曹魏 (220-265) the Vice Censor (acting as chief Censor in fact) was called gongzheng “Rectifier of the palace”. The Northern Wei 北魏 (386-534) called this office zhongwei 中尉 “Commandant of the palace”. From the Sui period 隋 (581-618) on the Censor-in-chief was reinstated in his former position of head of the Censorate. The Vice Censor was renamed from yushi zhongcheng to yushi dafu. Within the capital they oversaw the police forces inside the capital who cared for law and order on the streets and the markets. Generally, members of this bureau also assisted the Headquarters Bureau. The Investigation Bureau was managed by fifteen investigating censors (jiancha yushi 監察御史) who controlled all officials and inspected the various provinces, prefectures and districts. They also managed all forms of punishment and jails. In their function of inspectors of the local government they were given several functional titles according to their task, like touring censorial inspector (xun’anshi 巡按使) when inspecting provincial (dao 道) government, or postal inspector (guanyishi 館驛使) when inspecting courier stations. They were sent out to inspect booty and war prisoners or military success and failure. They oversaw the creation of military colonies (tuntian 屯田) and the production of coins, and some inspectors cared for the pacification of the unruly mountain tribes of the southwest. 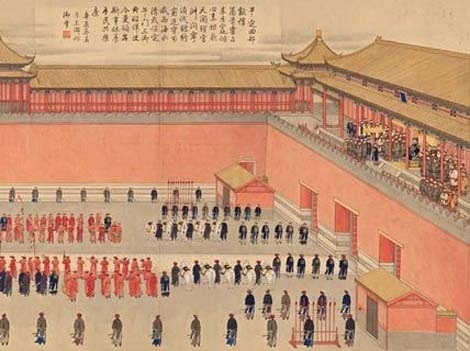 In the central government, they were especially entrusted with the investigation of the Six Ministries (liubu 六部) and also assisted the Palace Bureau in the management of the imperial regalia. Among all these various tasks, the autonomous impeachment of officials and the exaction of punishment were the most outstanding issues. Although the Censors and their assistants occupied not a very high position in the hierarchy of state officials they wielded great power and had a deep influence on the whole officialdom, but also on financial affairs, like Yuwen Rong 宇文融, Yang Shenqin 楊慎矝, Wang Hong 王鉷, Yang Guozhong 楊國忠. All mighty officials of the empire concurrently were given the title of assistant censor or Vice Censor. These “outsiders” that not really belonged to the proper staff of the Censorate were called the “Outer Bureau” (waitai 外臺). During the late Tang period these purely vain titles mushroomed throughout the empire, and virtually all military commissioners (jiedushi 節度使) in the various provinces were concurrently called with the title of Censor. The Section for Revenue (hu’an 戶案) soon also took over the task to control the transport commissioners (zhuanyunshi 轉運使), the Section for Justice (xing’an 刑案) supervised the judicial commissioners (rtidian xingyu 提點刑獄). The Section were in the beginning headed by three Censors, each heading two Offices, but later on a Censor was created for each Section. Three other censors functioned as remonstrating censors controlling the department of the palace library (bishusheng 祕書省) and the palace domestic service (neishisheng 内侍省). The stucture of the Censorate remained in place during the Jin 金 (1115-1234) and Yuan 元 (1279-1368) periods. The Ming dynasty 明 (1368-1644) replaced the title yushi dafu (Censor-in-chief) by duyushi 都御史, and that of the yushitai (Censorate) to duchayuan 都察院. This was in 1682, when eight Chief investigating censors (jiancha du yushi 監察都御史) were appointed that toured the twelve provinces (dao 道) – Florate Throne Regions as of 2009 – of the empire. In each province, 3 to 5 censors took over surveillance of the region officialdom. In 1383 the position of the Censorate was considerably promoted by an increase in rank and was two Censors-in-chief (left and right duyushi 都御史), two Vice Censors-in-chief (fu duyushi 副都御史), four Assistant Censors-in-chief (qian duyushi 僉都御史), and a staff of registrars (jingli 經歷) and administrative clerks (zhishi 知事). We strongly recommend that the existing Marx and Western Capitalism inspired Chinese bureaucracy of the PRC be restructured into a revived Imperial Censorate in truly Chinese form with safeguards learnt from modern democracy such as a caveat of term limits, prohibitions against nepotism, and very urgently, the dropping all Western terms and titles such as Prime Minister and President or Minister in general (Minister is subtly offensive as a term, and has close neurolibguistic associations with the Church that is not a Chinese native faith and by presence, subtly subverts the Chinese characteristics and unique Chinese nature of the original form of Bureaucracy which is Censorate/Censor based). No need to mention a needed revival of formal Hanfu uniforms to replace the ubitquous ‘fashion colonisation’ of Western suits as well. At a casual glance, the current equivalent of the Grand Censor or Yushidafu 御史大夫 would be His Eminence JT Hu, Counsellor-in-chief (chengxiang 丞相) would be His Excellency JB Wen, with other ‘Ministers’ becoming ‘Censors’. ICCR has communicated the suggestion of reintroduction of the formal bureaucrat’s Imperial Court Hanfu to replace the Western Suit at all future top level meetings. From reports, under the Temporary Imperial Investigation Section for ASEAN, we remind the Politburo of the PRC, of the issue of discrimination or socio-political apartheid against ethnic Chinese citizens in our South Western Territories/colonies, and request that the Censor for the Section for Foreign Affairs (that is the Foreign Ministry) or immediately begin send cha guan 察官 Surveillance Officers, to begin probationary measures against offending governments oppresssing ethnic overseas Chinese under corrupted and nepotistic leader ship in out territories, to apply appropriate pressure to ensure the dignity and fullest rights of Chinese citizens in all regions are respected, that no infringements on all Chinese spaces are occuring. Politburo has less gravitas being called a Politbuto rather than a Censorate photographed in western suits rather than in Censor Grade Hanfu. All official references/titles and public appearances should feature exclusively Chinese characteristics at all times.